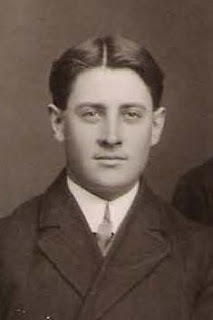 George Andrew Carruthers was born on July 5, 1885 in Morewood, Ontario. His mother was the former Elizabeth Gordon and his father was Archibald Carruthers. Both of his parents were 27 when he was born and he was the middle of their 5 boys. Sadly, Elizabeth died in 1893 and his father remarried Annie Gainer and they had 2 more boys and 4 girls together, including two sets of twins. 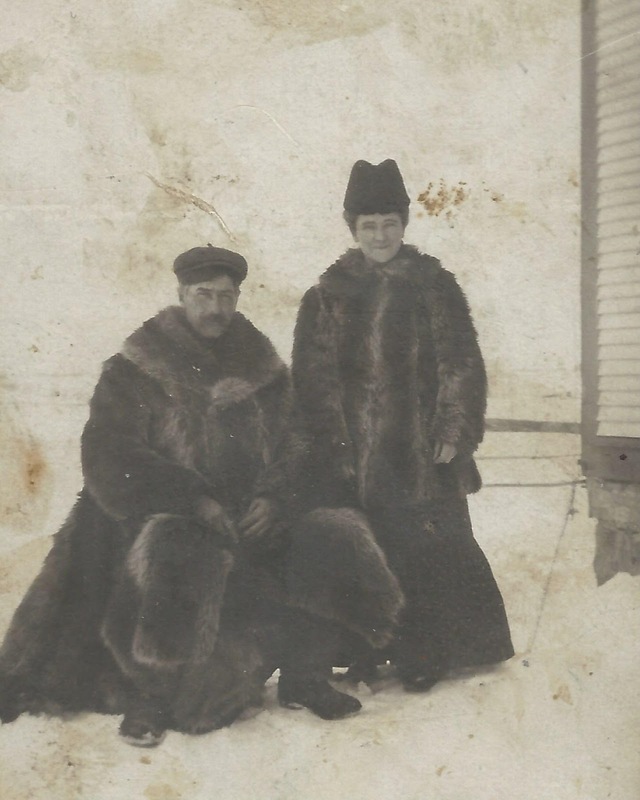 On the 1901 Canadian Census he was a 15 year old boy living with his farming parents but 10 years later a 26 year old George Carruthers is found in Calgary, AB, living as a lodger at 1039 5th Avenue West. Google Street view here, has it looking a little different today than it did then! It may or may not have been him on that census but I do know over the years, George had made several trips from his home in Ontario to Manitoba to help with harvest and then established himself at 29-10-27, 4 miles south of Hargrave. That would have been about the time George on the left and my Grandpa, his cousin, Frank Kinnaird had the above photo taken. On August 20, 1912 George married Charlotte Jeanetta (Nettie) Pollock in Winnipeg. He was 27 and she was 22. She was born in Berwick,Ontario so they likely grew up together there. 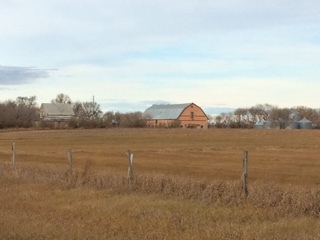 In 1920, they moved 1 1/2 miles west of Virden , just west of where the Vet Clinic is today. 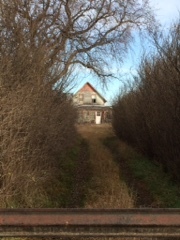 The pictures of this farm below were taken in 2015 and as they seem very unusual in that the barn (below right) was built with brick walls as was pointed out during an "ancestral tour" around Virden with my cousin Rea last summer. Life on the farm in the Pacific School District area of Manitoba was a strenuous and very interesting adventure in the 1920's and 1930's, and one which I enjoyed immensely. By present-day standards it would probably be considered harsh and difficult, but for me any my immediate family, it was a great adventure. Times were indeed difficult, but I had an enterprising father and mother who were equal to the challenge of light sandy land with soil drifting, drought, grasshoppers, rust, very low grain prices, etc. Certainly the times called for courage and ingenuity! We were engaged in "mixed farming". We had quite a large number of cattle, both dairy and beef, hogs, bees, a large productive garden, and most important, a large poultry business with R.O.P. Breeding stock. He was also interested in soil conservation and was the first to actively practice "strip farming" in our part of the province. In addition, to supplement the soil fibre and provide excellent feed for livestock, he grew large quantities of sweet clover. Also, he was early in using fall rye and flax in crop rotation planning. 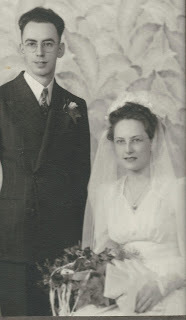 Ewen Carruthers married Pearl McDonald in 1943 and their wedding photo above was among my Grandma's pictures and was identified by Aunt Marge. Ewen was in the Air Force in WWII and later became a cardiologist in Kelowna and died there in 2002. Gladys took nurse's training at Montreal and went on to work as a Public Health Nurse in Winnipeg. She married Lee Schreibeis and lived in Pennsylvania and later New York State. She died in 2008. George Andrew Carruthers died at the age of 92 on Christmas Day in 1977 in Kelowna, BC and Nettie had predeceased him there in July of 1975. It's nice to know a bit about the people that once lived there as I drive by their former home. Every empty farmyard has a story.